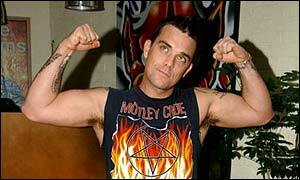 Cash-strapped Port Vale have approached pop star Robbie Williams to see if he will give them some cash. Administrators hope the multi-millionaire star - who has just signed an £80m record deal - might invest in his favourite team. Vale went into administration in December with debts of more than £2m. The club is estimated to be losing £500,000 a year and has a tax debt of about £600,000. "I don't think that we can rely on there being some saviour out there who's suddenly going to pump hundreds of thousands, or millions, of pounds into this club", said administrator Bob Young. "Being where we are, everyone talks about Robbie Williams. "I have got a letter through to Robbie in Los Angeles. "He knows this club's for sale but I don't think we should rely on the fact that he's going to bail us out." Insolvency practitioners Poppleton and Appleby have been running Port Vale since the club went into administration.